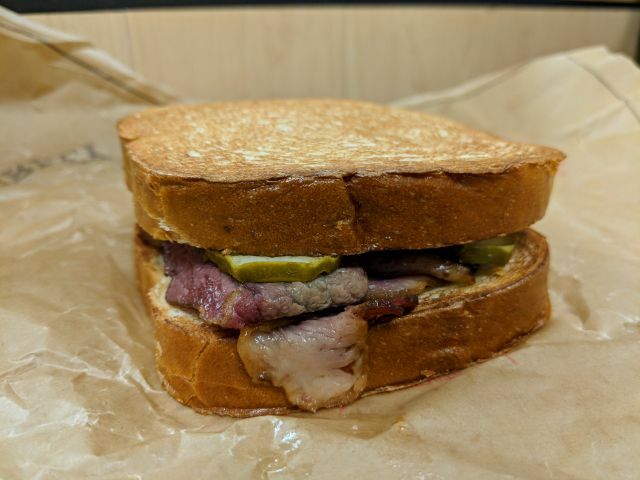 Arby's Texas Brisket sandwich features smoked brisket, crispy onion strings, "Texas-style" barbecue sauce, and pickles on Texas toast. It cost me $6.09 for one. One of the key features, the Texas toast, did not turn out crunchy or buttery. It basically tasted like thick, soft, and chewy white bread. The brisket turned out juicy (I haven't had much luck on the moist front with the brisket at my local Arby's on previous visits) and flavorful with a slight smokiness. Unfortunately, the meat was outshone by an almost aggressively tangy barbecue sauce that delivered a bit of a spicy kick and light touch of sweetness. Less would have been more here. The onion strings got lost in both taste and texture. 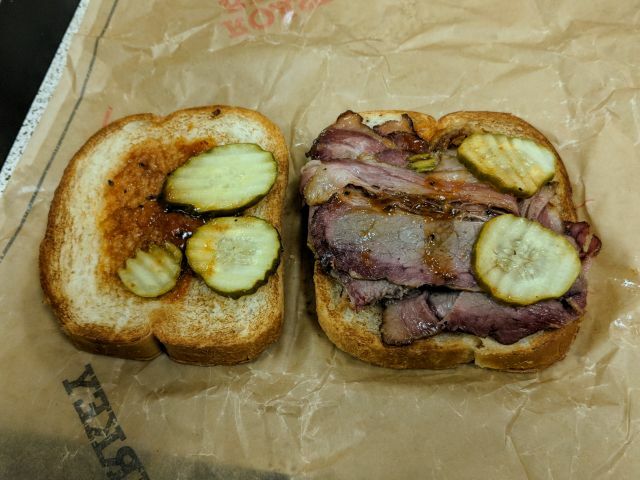 The sandwich could have used that onion-y bite but I think they would have had to at least double the amount of strings for the crispiness and onion flavor to break through. The pickles delivered the crunch that was lacking from the bread and onions but also pushed up the tangy notes with a sour burst. 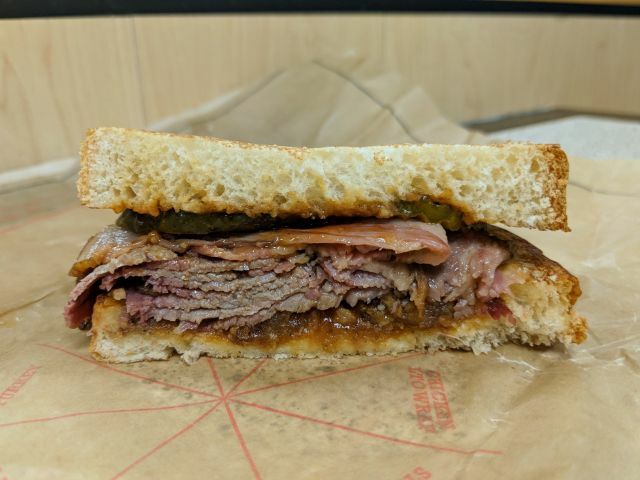 Taken altogether, Arby's Texas Brisket Sandwich turned out to be less than the sum of a relative few parts. If you're looking to try it, I recommend asking for the sauce on the side and either extra onion strings or ordering some onion rings (which add a substantial crunch and a nice sweet quality) to put in the sandwich yourself.